This page details everything you need to get started with using your NanoTwo ESC. You will need a couple of components to go with your NanoTwo ESC to complete your electronics. The NanoTwo is designed to work with N20 Gearmotors in 2wd or 4wd configurations. When combined with our ToughHub wheels they produce a competitive drive setup in antweights used by many antweights throughout the UK. The NanoTwo ESC is typically run off of a 2 cell LiPo battery. For normal antweight use a 180mah – 300mah battery is recommended, Nuts And Bots recommends Turnigy Nano-tech 2s 180mah batteries. This battery will be plugged into the red JST connector on your ESC so ensure you purchase one that has the matching red JST connector. 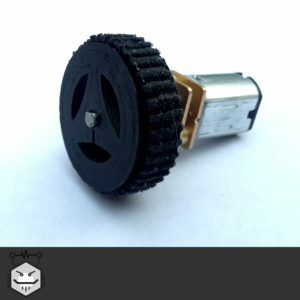 As well as the parts needed in your robot you need a couple of extra bits of equipment to complete your setup. 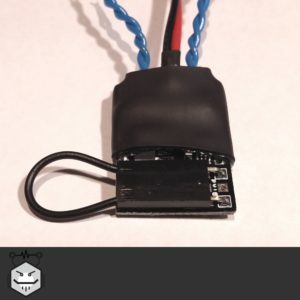 LiPo battery charger compatible with small 2s (2 cell) batteries is required. 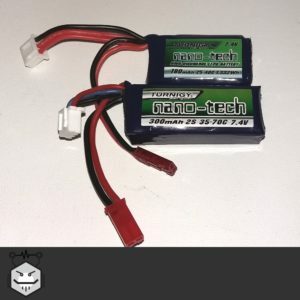 Small LiPo’s like in antweights aren’t demanding batteries for chargers but we have a couple of recommended favourites. 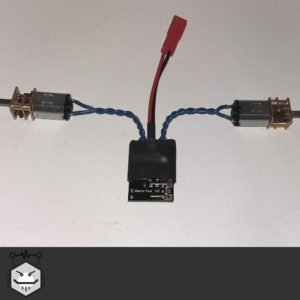 The Turnigy 2s/3s Basic Charger is a good budget option that along with a common 12V ~1A Power Supply adaptor (Or even a laptop power supply up to 15v) will provide easy charging for you. For a more capable charger Nuts And Bots uses the Accucel 6 charger with a 12v ‘LED Power Supply’ of appropriate power which can be used with batteries from antweight all the way to heavyweight level! Your battery should always be charged in a suitable LiPo safe bag. To setup your ESC you simply need to solder on your motors. You can attach a motor to each pair of twisted blue wires on the NanoTwo with the wires across the motor terminals (See Below), you must not allow the blue wires to touch each other while in use as this may damage your NanoTwo. To ensure your motors are connected correctly position your ESC so the Battery lead is on the top of the ESC and facing the rear of the robot. Each twisted pair of blue wires should then be soldered to the motor on their side. If one motor is turning backwards simply swap the connections on that motors terminals. Any servo or component utilising a servo connector simply plugs into the 3 pin servo connector on the NanoTwo (Ground/Black/Brown towards the edge of the ESC). Before the controller can be used, it must be bound to a transmitter. This only needs to be done on first start up or when switching to a different transmitter. First ensure your ESC is disconnected from any power. To bind the controller to a transmitter, connect the bind plug to the two pins on the front of the controller (as shown in the picture below). 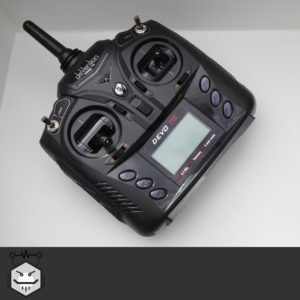 It is important when you bind to make sure the transmitter sticks are in their normal positions (allow the springs to centre all sticks and have the throttle stick down). Plug the battery in; the LED on the kit should then start flashing rapidly. Follow the bind procedure for your transmitter to put it in bind mode (See your manual for details. For example spektrum transmitters require being turned on while the trainer switch is held), wait for the light to go solid and exit bind mode on your transmitter. If you have a Devo 7e refer to the Devo 7e Specific Guide. Your robot should be controlled but it may not be quite right, the wheels may try and turn on their own. These are fixed with trims, they simply nudge where the middle position of the joystick. Your trim controls are typically the buttons immediately to the side and below the joysticks. If your robot is trying to steer left or right simply press the trim button in the opposite direction on your steering stick until it doesn’t, the same applies to the forwards and backwards. The easiest way to do this is to position the robot the right way up but with all wheels lifted off the ground, when you push forwards on the stick all wheels should start at the same time. If they do not make a note of which way the robot would be turning and click the trim in the opposite direction. Keep repeating until all the wheels begin turning at the same time. Now use the steering stick to turn the robot, again both wheels should begin turning at the same time. If they do not not if the wheel that is moving first is going forwards or backwards, click the trim for forwards and backwards in the opposite direction. Keep repeating until all the wheels begin turning at the same time.